Pour boiling water on gelatin in large bowl; stir until gelatin is dissolved. Reserve 3 to 5 berries for garnish. Place remaining berries in food processor workbowl fitted with steel blade or in blender container. Cover and process until smooth. Stir berries into gelatin. Refrigerate about 1 hour or until very thick but not set. Beat gelatin mixture with electric mixer on high speed about 4 minutes or until thick and fluffy; set aside. Beat 1 cup of the whipping cream in chilled small bowl on high speed until stiff; fold into gelatin mixture. Pour into springform pan, 9x3 inches. Refrigerate about 3 hours or until set. Run knife around edge of dessert to loosen; remove side of pan. Place dessert on serving plate. Beat remaining 1 cup whipping cream in chilled small bowl on high speed until stiff. Spread half of the whipped cream on side of dessert. Carefully cut cookies crosswise in half. Arrange cookies, vertically and with cut sides down, around side of dessert; press lightly. Garnish with remaining whipped cream and berries. In 1923, horticulturist Rudolph Boysen crossed a raspberry, blackberry and loganberry to create the boysenberry. This purplish red fruit is shaped like a large raspberry and has a rich, sweet-tart flavor. Feeling peachy? 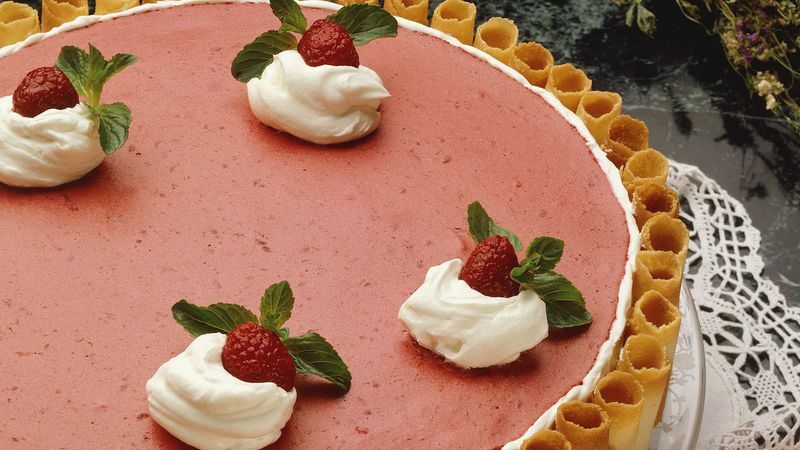 Try Peach Pirouette Torte: Substitute a 16-ounce bag of frozen sliced peaches, partially thawed, for the boysenberries and orange-flavored gelatin for the raspberry-flavored gelatin. Reserve 3 peach slices for garnish.